The Murrayfield Hotel exclusive Gifts now available to purchase securely online. Personalise a gift voucher, add a message, preview and send it instantly by eMail, SMS Text or 1st Class Post. 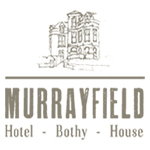 Enjoy afternoon tea at The Murrayfield Hotel, Edinburgh with this voucher. Indulge with a selection of cakes, scones with cream and jam, fresh strawberries, finger sandwiches, tea or coffee with a glass of Prosecco. Available daily from 1pm to 5pm, advance booking required and is subject to availability. Enjoy Thursday steak night for two people. If you have a query or special request please call 0131 337 1844.